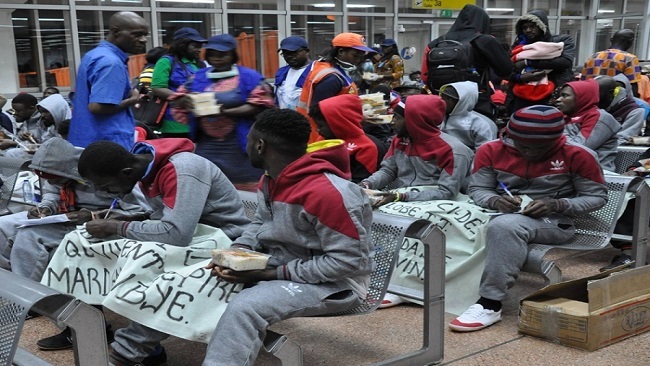 Last week (19 April) 121 Cameroonian migrants returned home from Libya after being assisted by IOM, the UN Migration Agency. The returnees were welcomed at Nsimalen international airport in the capital Yaoundé, by representatives from the European Union Delegation, Cameroon’s Ministry of External Relations and Boubacar Seybou, IOM Chief of Mission in Cameroon. Upon arrival, the returnees received medical check-ups including psychological support from the Ministries of Health and Social Affairs. IOM provided food assistance and distributed a delivery kit to pregnant women, which included clothes, basins, towels and other useful material. “I have lived the worst nightmare in Libya, moving for nine months from prison to prison. And now that I’m back, I ask myself what pushed me outside Cameroon,” one of returnees told IOM staff at the airport. This latest charter was organized within the framework of the EU-IOM Joint initiative for migrant protection and reintegration in Cameroon, financed by the European Union and implemented by IOM. This project aims at strengthening the mechanisms for migrant protection and assistance all along the migration route. So far 1,357 Cameroonians (1,105 men, 252 women) have returned home under the initiative. In addition to facilitating the voluntary return to the country of origin of Cameroonian migrants, the EU-IOM joint initiative also focuses on supporting returnees’ reintegration in the country and on raising-awareness on the risks of irregular migration. The programme’s operations in Cameroon started in June 2017. With the cooperation of the Ministry of Youth Affairs and Civic Education, 184 returnees have been supported by IOM to start their livelihood activities. In addition, the business plans of more than 700 migrants have been approved as of the end of March, and the migrants will soon receive the material they need to start activities in fields such as agriculture, livestock breeding and retail, among others.